Have you wondered how it is to live in one of the most sustainable cities of the world and follow a study in business there? Being a student at Rotterdam School of Management delivered us this experience, as the city is considered to be the fifth most sustainable city of the world and our university takes lead on events that focus on sustainability. From the classroom to the businesses, in startup pitches and in the daily life of the local citizens everyone is highly concerned about sustainability, and we do not deny that all of this had an impact on us. 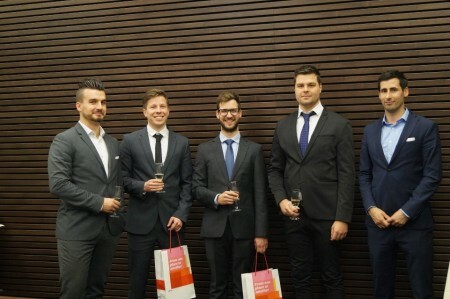 No surprise that we did not hesitate to participate on a case competition connected to sustainability when we had the chance. This chance was the annually held Make a Difference CSR and sustainability focused case competition where we decided to participate and compete with other teams from our university. This year, there were two tracks with two different cases during the event, with several teams competing within each track. One of the cases were provided by Siemens, while the other one was prepared by the Municipality of Rotterdam. Our team competed in the first track and solved the Siemens case which addressed the issue of how to increase the economic activity in the South-Holland region, while simultaneously increasing the degree of sustainability, the quality of life and economic growth. The case provided us ten different scenarios to reach this goal, and our approach was to evaluate each of them through the dimensions of their impact on economic activity, sustainability and quality of life. As a result, we have remained with five possible scenarios and we grouped them to two connected strategy: learn and build. These two strategies were aimed to overcome the mismatch between education and the labor market by linking students to experienced professionals and creating a closer cooperation between business and technological universities to support initiatatives for startups. The competition was intense, yet we had a strong advantage over other teams: we were all part of a case solving circle and we participated together on several workshops held by Rotterdam Consulting Club and CaseSolvers. As a result, we had a perfect teamwork and consistently follow same approach to tackle the case. Thanks to this, we were able in the first few minutes to divide the tasks and decided on the main approach, while others were still discussing their first impressions. This put us on the track, and by the end of the day, we succeed to create a strong solution together with an appealing story. The jury (the CEO of Siemens Netherlands and representatives from the Municipality) enjoyed our presentation and rewarded us as the winner of the competition. It is always an honor to present in front of an important jury, but at RSM the closing of a competition is even a bigger fun: after the long day of working on the case, together with other participants we were invited to celebrate our in the bar in the campus, right next to the venue, called Smitse. There we had a chance to discuss with the jury about our solution and receive some valuable feedback while having several beers. As a follow-up, we received the opportunity to present our solution at the RSM Sustainability Forum, one of the biggest sustainability related event on the campus that aims to bring students, company representatives and thought leaders together in order to discuss the issues related to sustainability and business model innovation. Here, Peter presented our solution in front of the 250 Sustainability Forum participants from all across Europe. All together it was a nice experience, we enjoyed both of the events and we are looking forward to any upcoming competitions.